Do you want to decrease arguing and conflict in your family? How about increasing intimacy? Would you like to increase the amount of influence you have with your spouse and children? Here is a single action that can do all that and more: listen! That’s right. Listening to your spouse and children will decrease arguing, increase intimacy, and increase your influence. But, to get the benefits you have to “really” listen, not just “fake it.” You can tell the difference between “faking it” and “really” listening with these eleven tips. You know you’re “faking it” when you are thinking about your response or rebuttal while your spouse/child talks. You know you’re merely “faking it” when you find yourself thinking about points your spouse/child has gotten wrong, misquoted, or misunderstood. You are still “faking it” when you think about ways of defending yourself and your actions while your spouse/child speaks. You are “faking it” when you find yourself looking around the room and not making eye contact with your spouse/children as they speak. You are “faking it” when you review accusations against your spouse/child even as they speak. You are “faking it” when you check your phone or look at your texts during your conversation with your spouse/child. You are “really listening” when you make appropriate eye contact with your spouse or children as they speak. You are “really listening” when you ask questions to clarify and better understand your spouse’s/children’s intent, motives, desires, and emotions. You are “really listening” when can restate your spouse’s/children’s message and they agree with you completely. You are “really listening” when you can identify the emotion behind what your spouse or child is saying and they agree with your label. You are “really listening” when you accept responsibility for your own actions and the impact your spouse/child say those actions had on them. As you can see, listening takes some effort. It means becoming humble enough to care more about understanding than being understood; humble enough to invest more energy in understanding your spouse than you invest in making them understand you. I offer you a challenge. 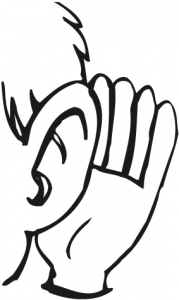 Practice “really listening” for the next month and see if your family life does not improve. I think you will be pleasantly surprised.